I thought about making a strawberry-lemon cake, but seeing as we didn’t have any lemons I couldn’t figure out a way to make that happen. My next idea was a vanilla bean cake with fresh strawberries, but I had just used some of my precious vanilla beans in a batch of blueberry muffins and figured I should branch out a little. 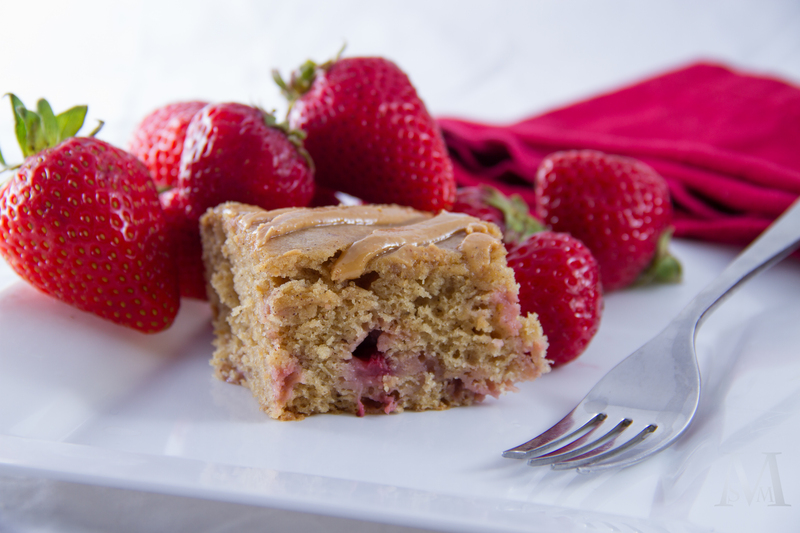 Then my eyes fell upon the jar of peanut butter in our fridge and an idea was born….peanut butter cake filled with diced strawberries! Just like pb&j, but with real fruit instead of jelly. Because fresh summer fruit always trumps jelly in my mind, just sayin. 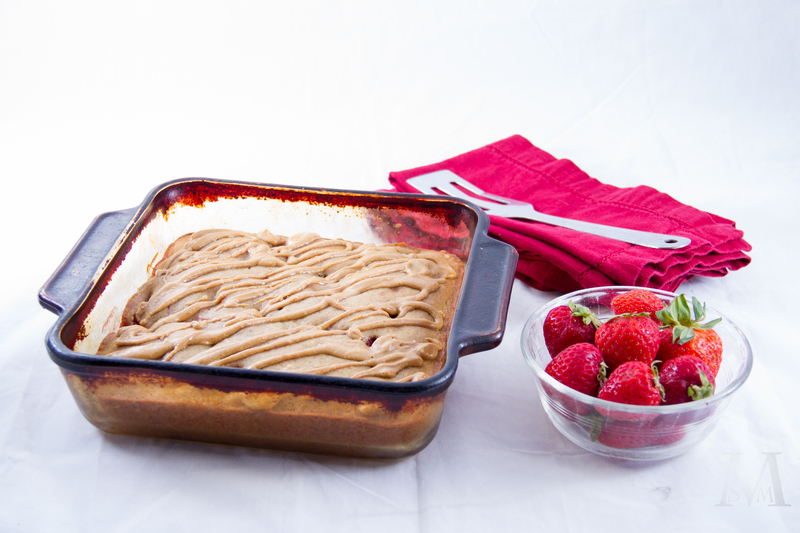 I found a recipe for a peanut butter-jelly coffee cake that I morphed into my Peanut Butter-Strawberry Snack Cake. Essentially it’s a soft, rich peanut butter cake studded with juicy pieces of strawberries and topped off with a drizzle of melted peanut butter. It can be served at room temperature or chilled, and tastes a lot like the classic pb&j that we all know and love. You can adapt this to your heart’s content, maybe using raspberries instead of strawberries, adding chopped peanuts to the cake, making a full-on peanut butter frosting, or going the true pb&j route and swirling some warmed-up jam into the cake batter. This cake definitely brightened up my rainy day! The combination of peanut butter and strawberries may sound a bit odd, but they taste amazing together. 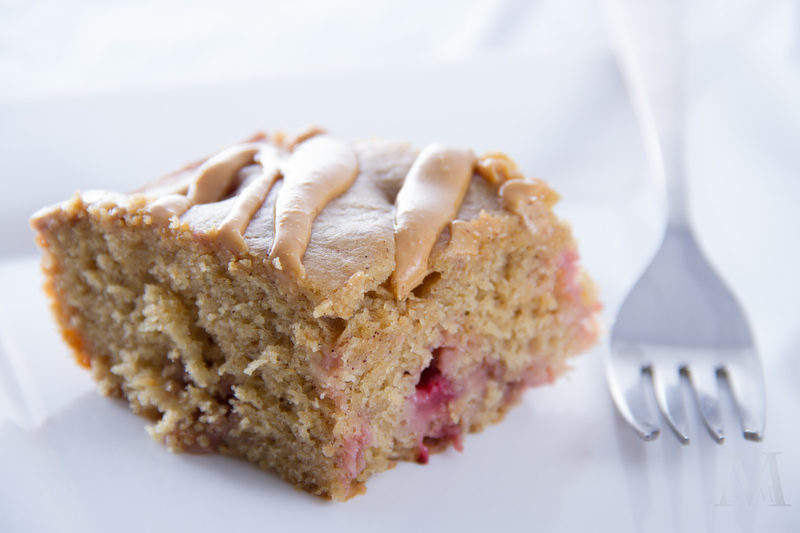 My Peanut Butter-Strawberry Snack Cake is a great little twist on the classic peanut-butter-and-jelly, and it will leave you wanting more! *You can make your own buttermilk by pouring 1/2 teaspoon lemon juice or vinegar into a measuring cup and adding enough milk to equal 1/2 cup. Let it sit for 5-10 minutes to curdle, then proceed with recipe. Preheat oven to 350 degrees F. Grease an 8″x8″ pan and set aside. In a larger bowl, use an electric mixer to combine the peanut butter, butter, and brown sugar until smooth. Add in the egg and vanilla, mixing until well-combined. Stir in the flour mixture and buttermilk in alternating increments, beginning and ending with the flour. Stir just until no flour streaks remain, being careful not to over-mix. Gently fold in the strawberries. Pour the batter into the prepared pan and smooth the top. Bake for 30-32 minutes or until an inserted toothpick comes out clean. While the cake is cooling, melt the additional 3 tablespoons of peanut butter (I used my microwave and it took about 30 seconds, stirring after every 10). 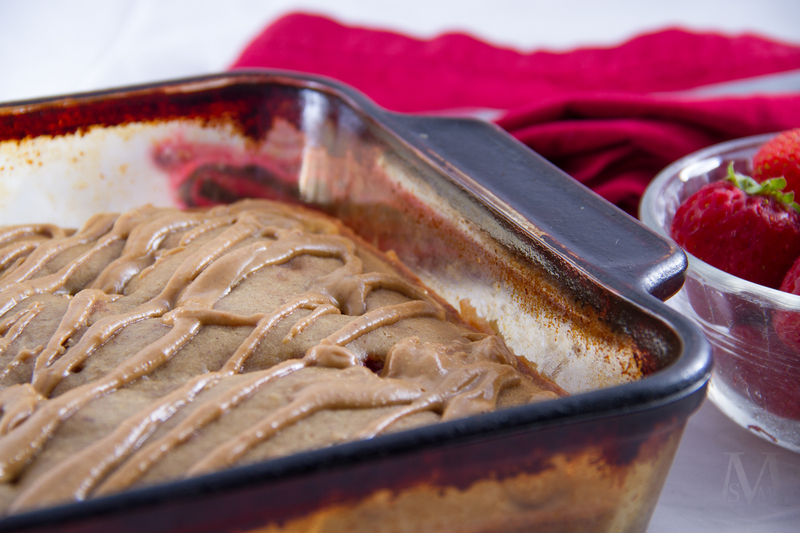 Using a spoon, drizzle the melted peanut butter over the warm cake. Let the cake cool completely, then slice and enjoy! 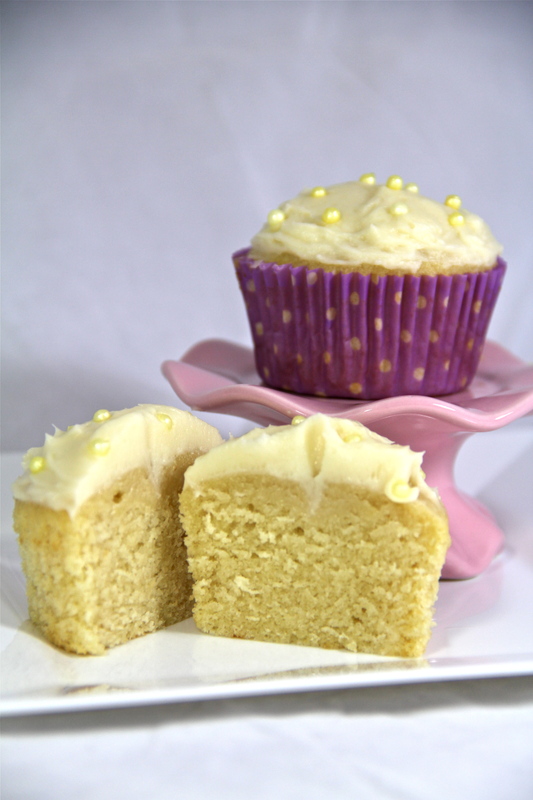 Fluffy Vanilla Cupcakes for Two…and Happy Birthday to Emma’s Baking Addiction! Exactly one year ago I sat down at the computer, created a WordPress account, set up a very simply formatted blog, and posted my very first recipe…Deceptively Simple Peanut Butter Cookies. As an avid blog-reader myself (and an avid baker!) I had been toying around with the idea of starting my own blog for quite some time, but never really got around to it. Then on a lazy summer day, as I was racking my brain for something to do, I decided once and for all to just go for it and start a blog. I had nothing to lose…basic WordPress blogs are free, after all, and the worst that could happen is that no one (except my parents, of course) would read it. One year later, my little blog is still chugging along. It’s still pretty basic, far from high-tech and fancy, but my stats tell me that there are at least a handful of people out there reading it other than my mom and dad! Since the whole point of my blog is to experiment with baking, writing, blogging, and photography, simply sticking with it for an entire year equals success in my mind. To celebrate, I decided to make a little birthday cake for Emma’s Baking Addiction. I didn’t want a huge cake or an entire batch of cupcakes hanging around since our house is still loaded up with pastries from Father’s Day and some very delicious bars which will be coming soon to the blog, so this recipe was absolutely perfect! It makes TWO perfectly sweet, soft, fluffy, vanilla-y cupcakes. No more, no less. A bowl, a spoon, a very short list of ingredients, and 15 minutes are all you need to bake up these little treats. They can easily be adapted by adding in chocolate chips, nuts, fruit, spices, etc. and they can be frosted or glazed however you wish to add a little excitement. To me, there’s nothing not to like about a simple vanilla cupcake topped with simple vanilla buttercream, so that’s what I went for. 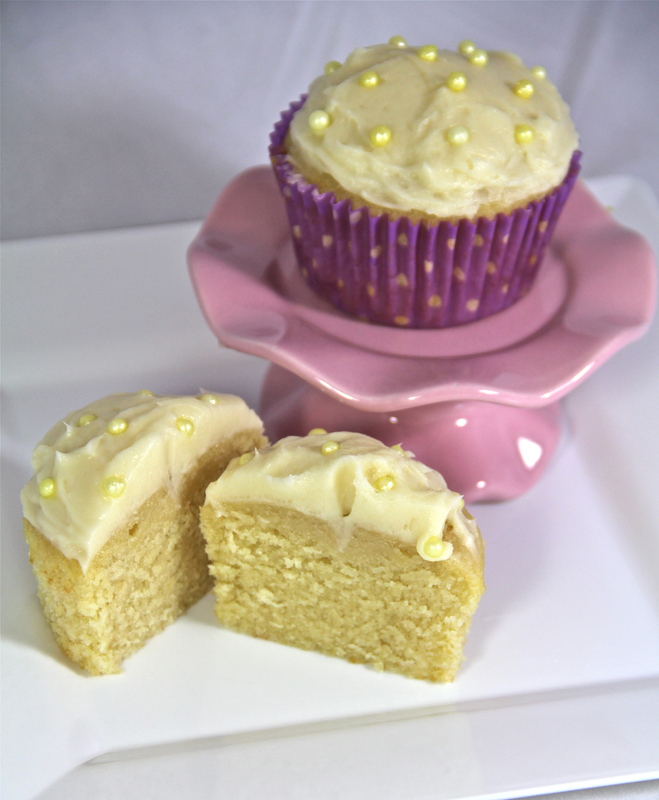 Just pure, sweet vanilla flavor in both the soft, fluffy cupcake and smooth, creamy frosting. 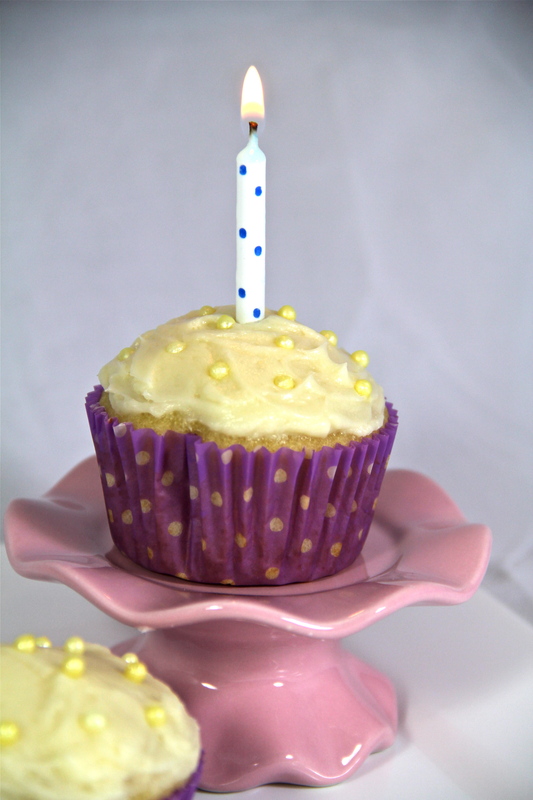 Happy First Birthday, Emma’s Baking Addiction! Preheat oven to 350 degrees Fahrenheit. Place two paper liners on opposite sides of a 6-cup muffin tin; set aside. In a small bowl, whisk together the sugar and egg white. Whisk in the melted butter and vanilla until smooth. Using a spoon, stir in the flour, baking powder, and salt until combined. Stir in the milk and mix until batter is smooth. Divide the batter evenly among the two muffin cups and bake for 12-14 minutes, or until the tops of the cupcakes bounce back when touched and an inserted toothpick comes out clean. Let cupcakes cool completely before frosting. For the frosting, beat the softened butter in a small bowl with an electric mixer until creamy. Mix in the vanilla. Gradually beat in the powdered sugar, followed by the heavy cream. If the frosting is too stiff, add in a little more cream or milk. If it’s too thin, add in more powdered sugar. 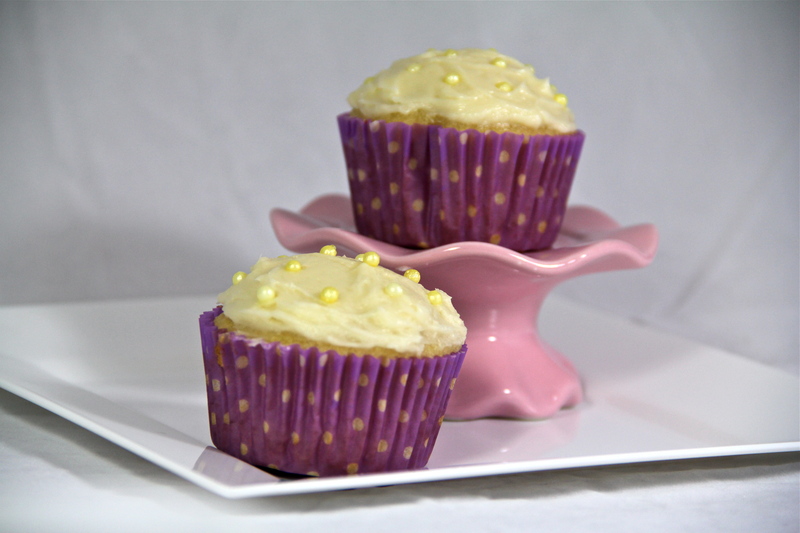 When desired consistency is reached, spread the frosting onto the cooled cupcakes and serve. The other day I drove to the store on a mission. I currently have 4 open bags of various flours in my pantry left over from gluten-free cake-baking, and I’ve been trying to use them up. Since my mom is gluten-free, I figured this was a perfect opportunity for me to bake some goodies that she could eat too. First on the list was a recipe for muffins made with oat flour, just the thing for a healthy, filling, delicious breakfast treat. A treat that also made good use of my oat flour, of course! All I needed was a box of raisins. I should have known that I wouldn’t be able to walk out of the store with nothing but one measly box of raisins. Before I even made it through the automatic doors I spied a display of asparagus. One, it was on sale; two, our refrigerator was looking sadly barren in the vegetable department; and three, the asparagus looked so, so plump and fresh. Come on, for an impulse buy, asparagus is certainly not something to be ashamed of. But as I happily bagged up my nice green stalks, I noticed another item nestled alongside the asparagus. Limited-time-only, raved-about-by-multiple-food-bloggers, hybrid-of-a-lemon-and-mandarin-orange, Meyer lemons! Without a second thought, I plucked up a bag of the deep yellow beauties and dropped it into my cart. I just couldn’t resist. Believe it or not, I’d never before had a chance to try a Meyer lemon, even though I’ve heard multiple people wax poetic on their sweetness, mega-flavor, and superiority to regular old lemons. The healthy oat muffins dropped down a few places on my mental to-bake list and my new beautiful Meyer lemons took front stage. 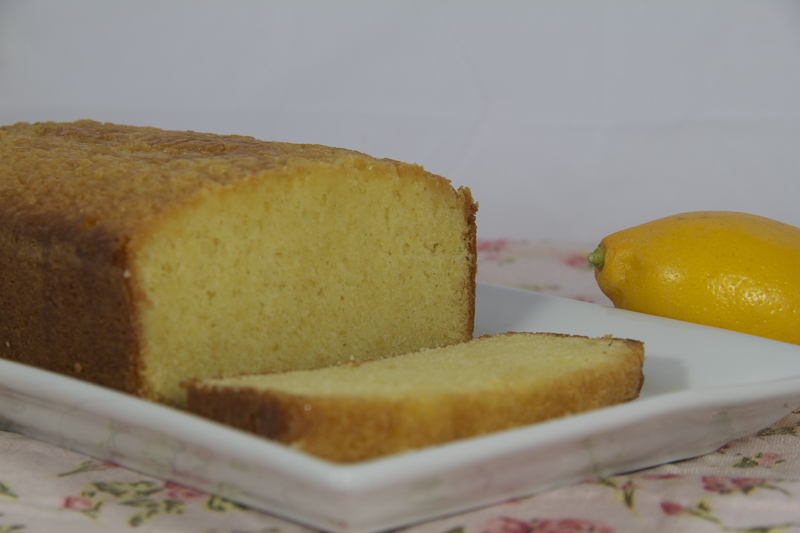 After much debate, I decided to try out a Meyer Lemon Loaf Cake that I had previously goggled over at Brown Eyed Baker. Luckily I had all the ingredients at home, because I wasn’t about to go back to the dangerously distracting grocery store. I got the cake mixed up in a jiffy, and into the oven it went. The hardest part was letting it cool for an entire hour after being drenched in a sweet lemon glaze. Waiting was pure torture! I now understand all the rage about Meyer lemons! They really do have a distinct flavor from normal lemons, being much sweeter, fruitier, and less acidic. The loaf cake had a soft, delicate crumb, was sweet-but-not-too-sweet, and was absolutely bursting with lemon flavor. Also, since it’s baked in a loaf pan you can absolutely call it a quick bread and eat it for breakfast! If you happen to spot Meyer lemons being sold at your grocery store, I recommend letting yourself have a little impulse buy! 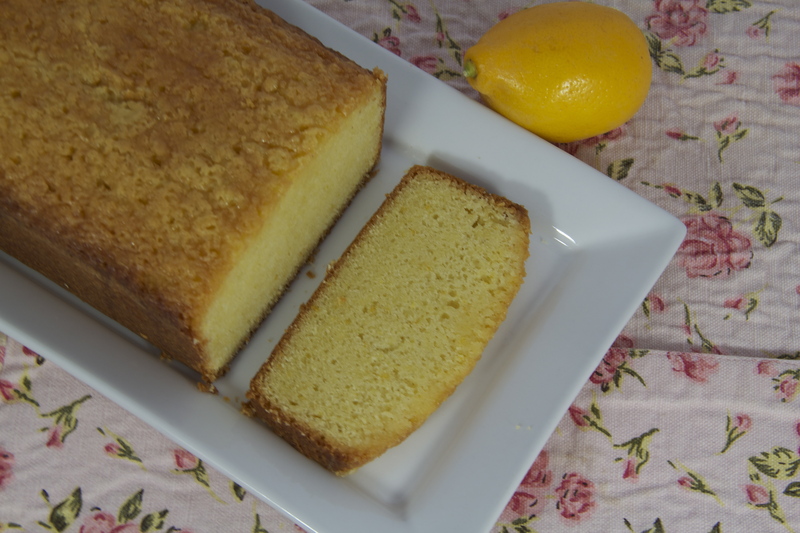 You can use them in the place of lemons in any recipe you like, but of course I’m biased to this loaf cake. Enjoy! Preheat oven to 350 degrees F. Grease and flour a 9″x5″ loaf pan. In a medium bowl, whisk together the flour, baking powder, and salt. Set aside. Place the sugar and lemon zest in a large bowl. Using your fingers, rub the zest into the sugar until the mixture is well-combined and moist. Using an electric mixer, beat the eggs into the sugar mixture one at a time, followed by the vanilla and 2 teaspoons lemon juice. While mixing, pour the melted butter into the bowl in a steady stream, occasionally scraping down the sides with a rubber spatula. Add the flour mixture in three increments, whisking gently with each addition. Mix just until no flour streaks remain. Pour the batter into the prepared pan. Bake for 15 minutes, then decrease the oven temperature to 325 degrees F. Bake for an additional 33-35 minutes, rotating the pan halfway through. When the loaf cake is golden and an inserted toothpick comes out clean, remove the cake from the oven. Let the cake cool in its pan for 10 minutes. Meanwhile, make the glaze. Stir together the 1/4 cup of lemon juice and 1/2 cup of sugar in a small saucepan over medium heat. Bring to a boil, then reduce heat to low and simmer for about 2 minutes, stirring frequently, or until the mixture has slightly thickened. Run a knife along the edges of the loaf cake and invert it onto a wire rack. Use a toothpick to poke holes all over the top and sides of the cake. 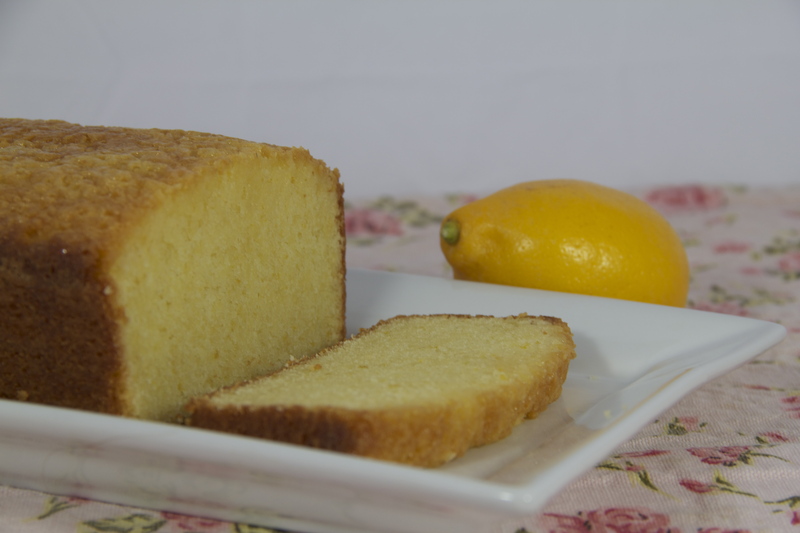 Generously brush the cake with the lemon glaze. Let the cake cool for at least 1 hour, then cut and serve. The cake can be wrapped in plastic wrap and stored at room temperature for several days. It’s amazing how much my baking has evolved over the years. Neither of my parents were all that into baking, aside from homemade teething cookies when I was a baby and the occasional batch of muffins, so most of what I do is self-taught. When I first started baking at around the age of 5, I was just learning how to read. I could usually decipher the list of ingredients but the directions down below were more intimidating. I guess that’s why my strategy was to just mix everything together. I cringe at remembering how I used to make cookies. I would stir together all the dry ingredients (including sugar), “cut in” the cold butter, and then stir in eggs, vanilla, and whatever else the recipe called for. There was absolutely no creaming of the butter and sugar; no making sure that all the ingredients were at room-temperature so everything would bind, spread, and rise correctly; absolutely no regard for the fact that over-mixing flour breaks down gluten and makes baked goods tough. Somehow they still turned out tasty more often that not, but sometimes my cookies were either over-baked little rock mounds or flat, greasy pancake cookies. One day my aunt and uncle came to visit when I was about six, and I decided to make brownies for them. Unfortunately, the recipe used chocolate chips for the chocolate component, which needed to be melted first (as any fool might guess!). Of course this step happened to be mentioned in the instructions, and following my usual pattern of simply reading off the ingredients I just stirred the chocolate chips in with everything else. Let’s just say those brownies were on the crumbly side and had a lot, like A LOT of chocolate chips! Luckily my sweet six-year-old face saved me and everyone smiled and said they were delicious. For a few years I went through a cake-baking stage. I loved coming up with any possible excuse to bake a cake, whether it was the birthday of a teacher or an overlooked holiday or just because I felt like it. I had so much fun coming up with different combinations of cake and frosting and practicing my decorating skills. The only problem (aside from the fact that baking a 2-layer cake on a whim for a four-person family leaves a LOT of leftovers) was that I almost exclusively used boxed mixes and canned frosting. Cheap, shameful, chemical-ridden, artery-clogging, blood-sugar-spiking, can’t-even-call-it-food cake mix and canned frosting. No offense though, if you happen to be a fan. In all honesty, I see nothing wrong with baking from a prepared mix or using processed frosting now and then, especially in a time crunch, but now that I’ve become a baking snob I like to make as much as I can from scratch. That way I know what goes into what I’m making and there’s nothing in there that I can’t pronounce (with a few exceptions…xanthan gum?) Haha. My point is that if it’s at all possible, homemade is almost always better. 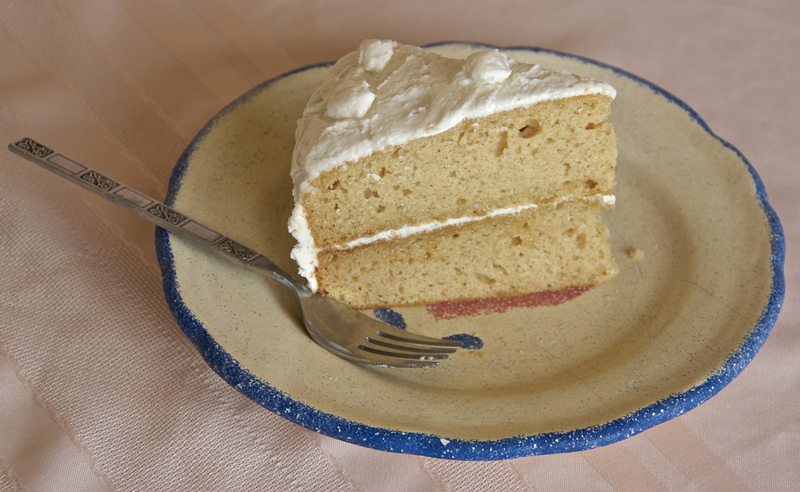 As good as boxed cakes taste, I find that homemade ones taste even better, AND they’re better for you. Minus all the sugar, fat, and white flour. Ahem. One of my favorite types of cakes is funfetti. I had always made it from a box until now. 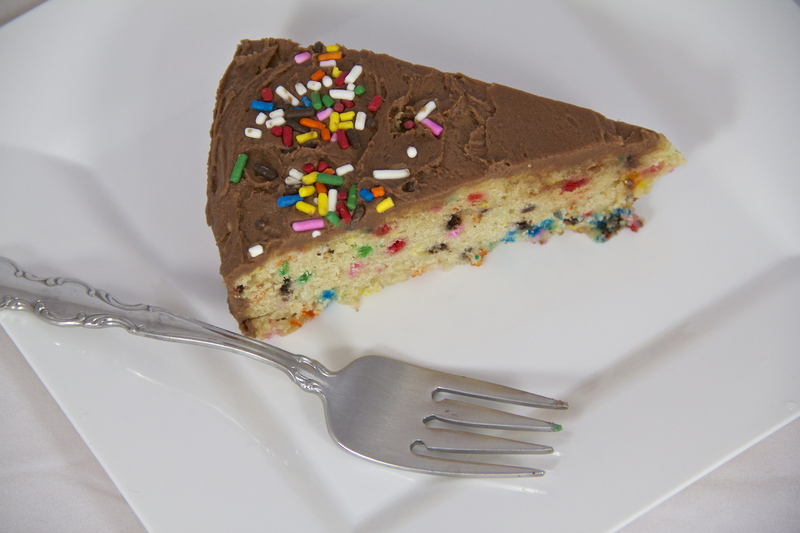 This recipe for homemade funfetti cake tastes just as delicious as the real thing….actually even more so! It’s full of sweet sprinkles, has a moist crumb, and is packed with vanilla flavor that comes from actual vanilla, none of that artificial junk. 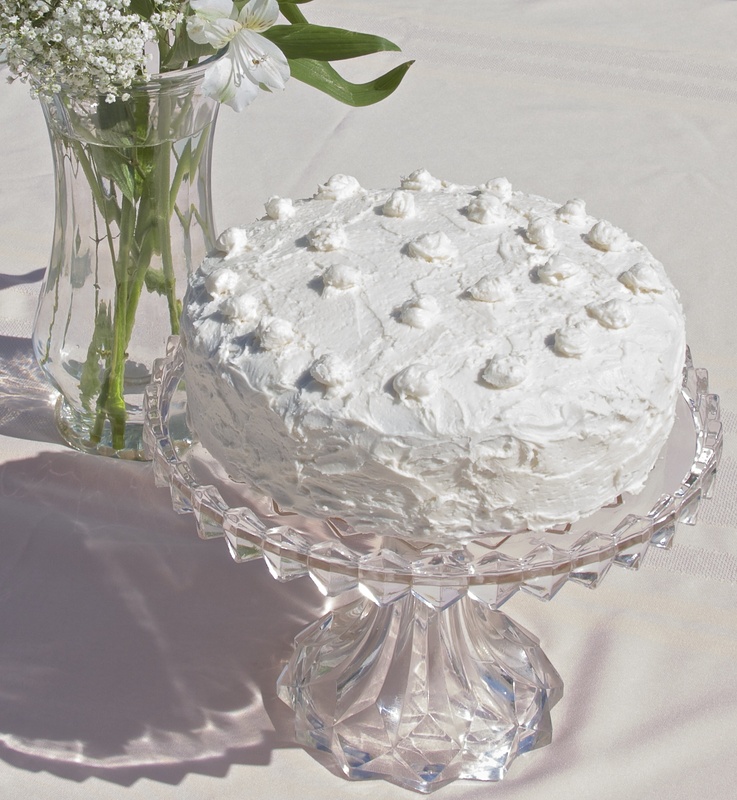 The recipe yields just one 9-inch cake, which I find to be perfect for small gatherings or feeding a small family, but if you’d prefer a 2-layer cake just double the recipe. Easy peasy. Paired with milk chocolate frosting this cake offered a wonderful combination of chocolate and vanilla, but frost it with whatever you like. Just not frosting from a plastic container ;). The next time you’re about to reach for a boxed cake mix, stop! This cake is made with everyday ingredients and is still extremely fast and easy…you don’t even have to break out an electric mixer! It tastes even better than boxed cake since it’s made with butter rather than oil, yogurt for moisture, and pure vanilla, and will be sure to please any and all funfetti-lovers. The milk chocolate frosting is smooth, chocolatey, and not too sweet….the perfect accompaniment. Preheat oven to 350 degrees F. Grease and flour a 9″ round cake pan. In a large bowl, whisk together the melted butter and sugars until smooth. Whisk in the egg, milk, yogurt, and vanilla until well-combined. Gradually stir in the flour mixture, stirring until smooth. Using a rubber spatula, fold in the sprinkles, mixing just until incorporated. Pour the batter into the prepared cake pan, smoothing the top with a spatula. Bake for 30-35 minutes, or until an inserted toothpick comes out clean. Let the cake cool in its pan for 20 minutes before removing to a cooling rack. Cool the cake completely before frosting. Using an electric mixer, beat the butter until it’s smooth and creamy. Add in 1 cup of powdered sugar and mix until combined. Add in the cocoa powder, vanilla, and cream, scraping down the bowl with a spatula as you mix. Gradually add in additional powdered sugar until desired consistency is reached. If the frosting gets too thick, add in a little extra cream or milk. Beat the frosting for 2-3 minutes or until fluffy. Spread onto cake, cupcakes, or cookies. Sarah casually suggesting that we drive into town and take a walk on the dock before dinner was ready, which seemed a little strange. My dad casually suggesting that we park in front of a certain restaurant downtown since the parking is so crowded everywhere during the summer, a piece of advice that seemed a bit uncalled for. Seeing our other friend Julia rush into the same certain restaurant holding a bunch of balloons as we circled around looking for a parking place, and Sarah acting frazzled that we had seen her. Walking toward the dock, which is located right next to the restaurant, and seeing 4 of my friends walk out of the restaurant, smiling oddly. In all honesty, it wasn’t until they all said “Happy Birthday, Emma!” that I figured out what was going on. I was actually thinking how coincidental it was that they all happened to be eating at the same restaurant at the same time, and was still trying to figure out who Julia might be bringing balloons to…anyone’s birthday I had forgotten about? Oh, that’s right. Mine! Needless to say, I was super surprised and incredibly touched by my sweet, sweet friends. It was a feeling that I wanted Sarah to get to experience too, which is why I decided right then and there that I would throw her a surprise party come April, her birthday month. 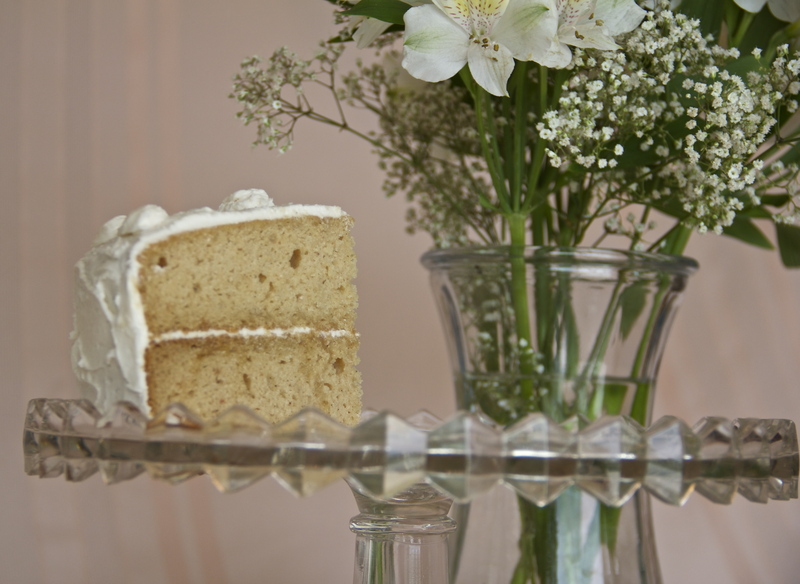 Due to some dietary restrictions, I knew we needed to have a gluten-free, dairy-free cake, and after scouring the internet for recipes that didn’t get reviews such as “has a grainy texture” or “tastes like glue” I finally found a recipe that looked pretty promising: Sugar Mama’s Gluten-Free Vanilla Cake. Unlike many gluten-free recipes that call for a store-bought gluten-free flour blend, this one contains 3 different flours all bought separately. 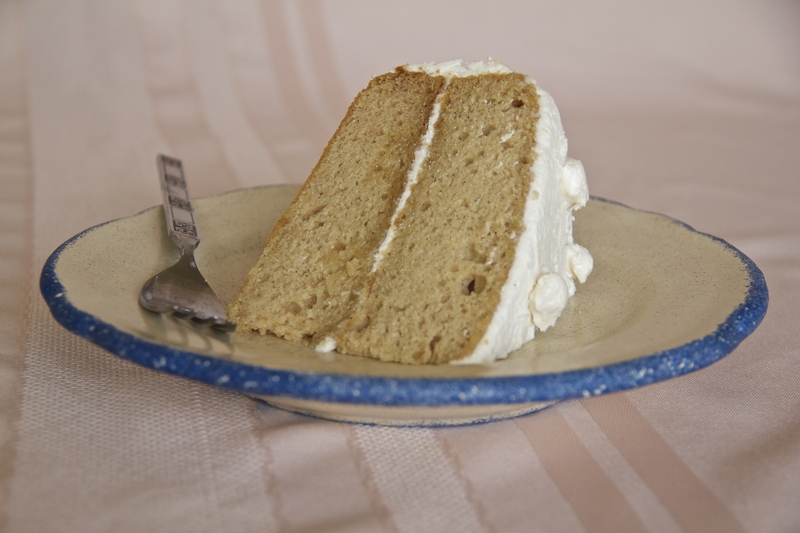 It was a bit of a splurge but definitely worth the price, because the combination of sorghum flour, tapioca flour, and coconut flour helped produce a cake that wasn’t just “good…for a gluten-free cake.” It was just plain good! For the frosting, I was all set to make a dairy-free vanilla frosting made with margarine sticks, powdered sugar, and vanilla. To make a long story short, frosting attempt #1 was a major fail. Not as in eh, I probably won’t be making this again since it’s not very delicious; this was a fail that entailed dumping an entire bowlful of greasy, gluey frosting down the sink. (Oh, the shame!) It just couldn’t be saved. No matter how much powdered sugar I added, the frosting continued to taste like greasy margarine. It also took on a lovely grayish hue. Back to the drawing board (er, mixing bowl) it was! Frosting attempt #2 was perfect. It would just so happen that as I was standing there, angry at having to waste all my ingredients in the batch before and having lost all my faith in the internet as a recipe source, I happened to spy a recipe for Buttercream Frosting printed on the back of my half-used bag of powdered sugar. Why not try it? It called for butter of course, but I simply swapped it out for Earth Balance margarine sticks and the frosting turned out wonderful. I used vanilla coconut milk rather than the regular milk the recipe called for, which gave an extra dose of vanilla flavor to the frosting. To be honest I think I prefer this to regular old buttercream. Yay, powdered sugar bag recipe! I’m so glad this cake turned out well. Now I have a good base-recipe for future endeavors in the gluten-free, dairy-free world. Since my mom doesn’t eat gluten or dairy, I foresee a delicious gluten-free, dairy-free birthday cake in her near future. Perhaps in the form of a surprise party! Too bad her birthday was last week. No more of that Oh, I don’t need a cake, it’s too much trouble since I’m gluten-free nonsense. 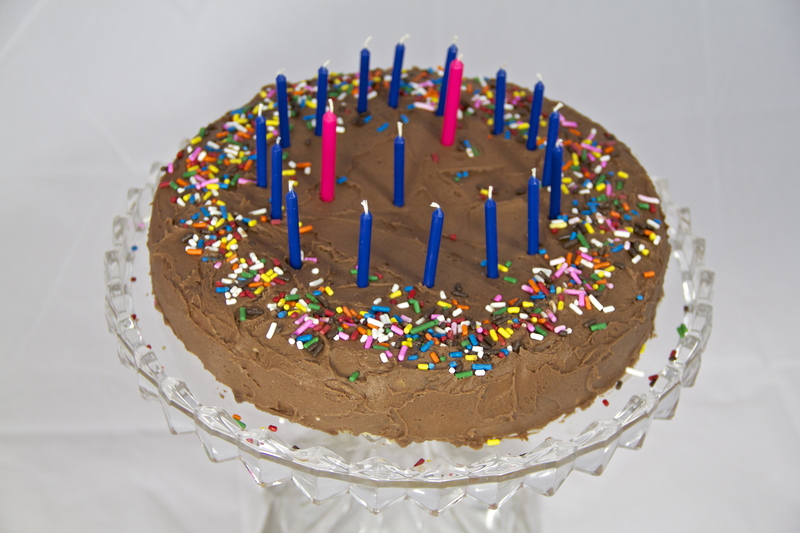 To quote Julia Child, “A party without a cake is just a meeting.” Well said, Julia, well said. Preheat oven to 375 degrees F. Grease and flour two 9″round cake pans and set aside. Measure the cup of coconut milk and add in the lemon juice. Allow the mixture to sit while assembling the rest of the ingredients. In a large bowl, whisk together all the flours, sugar, salt, baking powder, baking soda, and xanthan gum. Using an electric mixer, beat in the milk/lemon juice, water, oil, applesauce, and vanilla until smooth. Divide the batter evenly between the two cake pans and smooth the tops with a spatula. Bake the cakes for 30-35 minutes or until cakes are golden, the tops bounce back when lightly touched, and an inserted toothpick comes out clean. Let the cakes cool in their pans for 15 minutes, then run a knife around the edges and invert onto a wire cooling rack. Cool cakes completely before frosting. Beat together the Earth Balance, salt, vanilla, and coconut milk in a large bowl. Slowly add in the powdered sugar and beat until the mixture is smooth and creamy, scraping down the bowl with a rubber spatula as needed. If the frosting is too thick, add in more coconut milk 1 teaspoon at a time; if it’s too thin, slowly add in more powdered sugar until desired consistency is reached. Spread or pipe the frosting onto cooled cakes, cupcakes, or cookies. 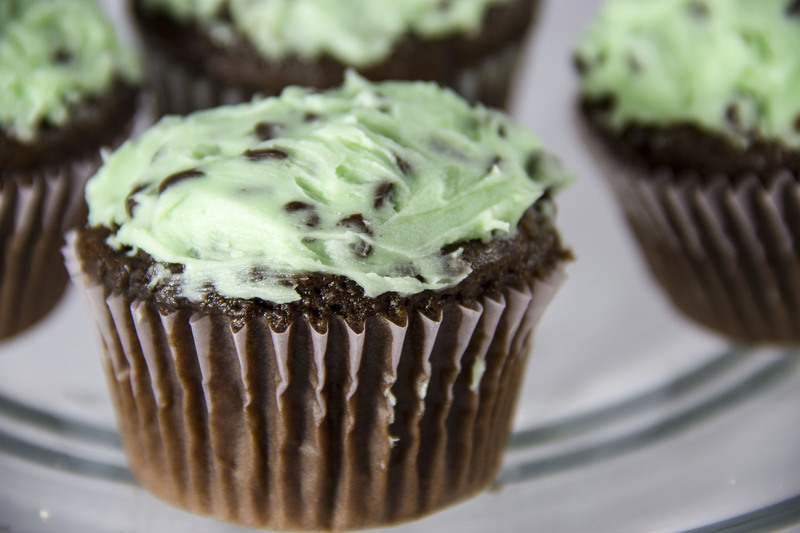 Leftover frosting can be stored, covered, in the refrigerator and brought back to room temperature before using. *Note: the coconut milk used in these recipes is NOT the type from a can. I used vanilla coconut milk purchased in a carton, which is much thinner than canned coconut milk. Cartons of coconut milk can usually be found in the milk section of your grocery store. A few weeks ago, while eating a bran muffin I had just made, my brother said, “You know what you should make, Emma? A bran cake, like these muffins but in cake form. You could use that pan, you know, with the giant hole in the top.” What he was trying to say was that he wanted me to bake bran muffins…in the form of a…Bundt cake. Interesting. In the past I’ve gotten lots of requests from my friends and family for things like chocolate chip cookies, blackberry pie, and pumpkin bread (normal, normal, normal) but this one really took the cake. (No pun intended!) Luckily, before I could reply he came up with a new idea: “Brownies, but in cake form. Like brownie cupcakes!” This brother of mine seems to have a peculiar obsession with converting normal baked goods into “cake form,” but hey, this one I could live with. I made a mental note to add Brownie Cupcakes to my baking agenda. 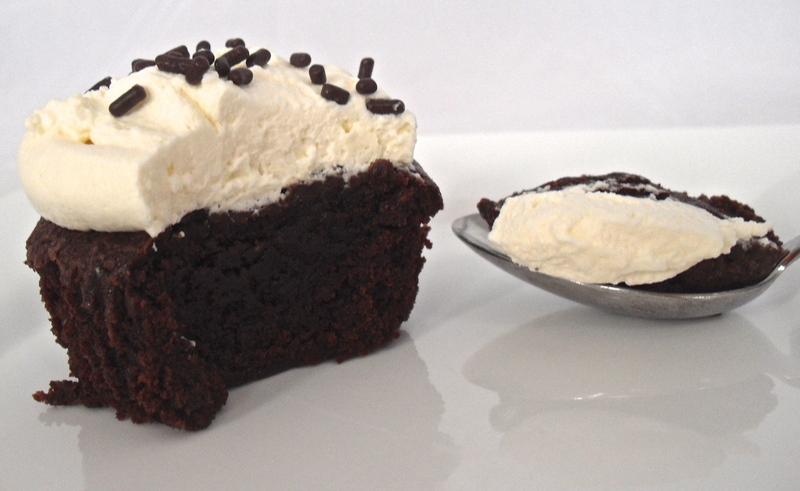 After scouring the internet for a good brownie recipe, one that could be adapted into cupcake form, I found this recipe for actual Brownie Cupcakes from Joy of Baking. 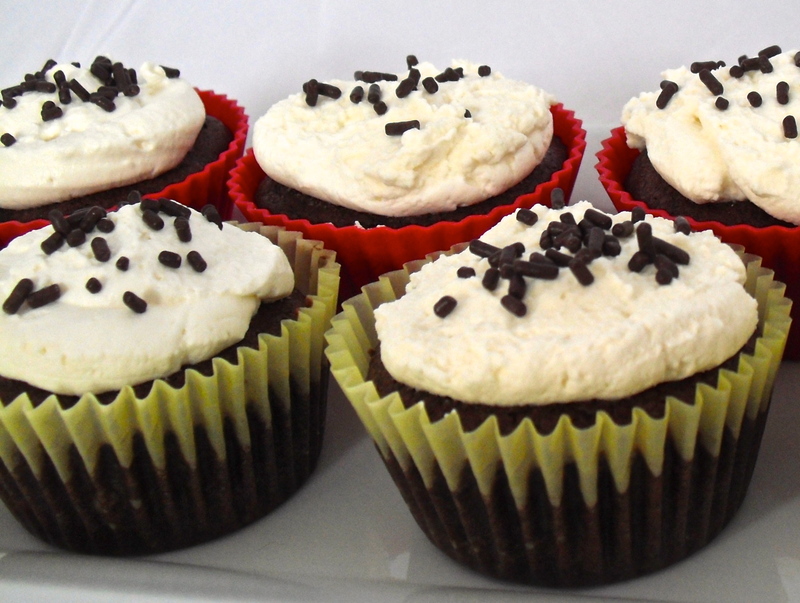 They were originally paired with a chocolate fudge frosting, but as good as it sounded I decided to go with a lighter topping so that the rich chocolatey cupcakes could really shine: whipped cream frosting. My brother just might be a genius. These were literally brownies in cupcake form: dense, chewy, chocolatey, and fabulous. The whipped cream frosting turned out light, fluffy, and not overly sweet, just as I had hoped, and I finished the cupcakes off with chocolate sprinkles. 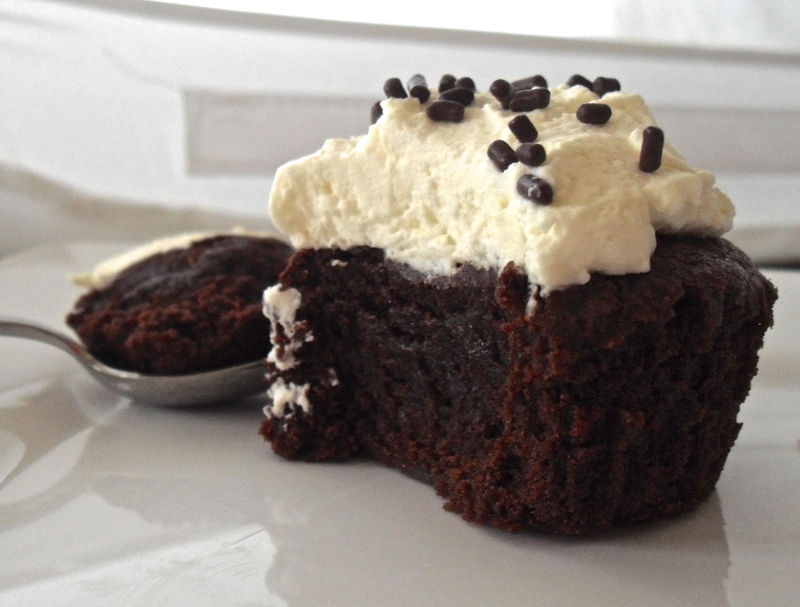 The combination of brownie-like cake and whipped cream frosting was even better than I thought, and they complimented each other perfectly. These would be a great Valentine’s Day treat, although I have no doubt that they’d be a hit any time of the year! I might have a hard time going back to regular chocolate cupcakes after these…I guess I should listen to my brother more often! Preheat oven to 325 degrees F. Line a 12-cup muffin tin with cupcake liners. Using a double boiler or a stainless-steel bowl placed over a pan of simmering water, melt the chocolate and butter, stirring with a wooden spoon. As soon as the mixture is smooth, remove from heat. Allow to cool for a few minutes, then pour into a large bowl (if you used a double boiler) and stir in the sugar. Next, mix in the vanilla until smooth. Add in the eggs one at a time, stirring until incorporated. Add in the flour and salt and stir until well-combined. Scoop the batter into prepared muffin cups, then bake for 20-25 minutes or until an inserted toothpick comes out with just a few moist crumbs. Transfer cupcakes to a cooling rack and cool completely before frosting. For the whipped cream frosting, beat the cream with an electric mixer on medium speed for about 1 1/2 minutes, or until soft peaks form. Add in the powdered sugar while beating, one tablespoon at a time, until stiff peaks form. Fold in the vanilla using a rubber spatula. 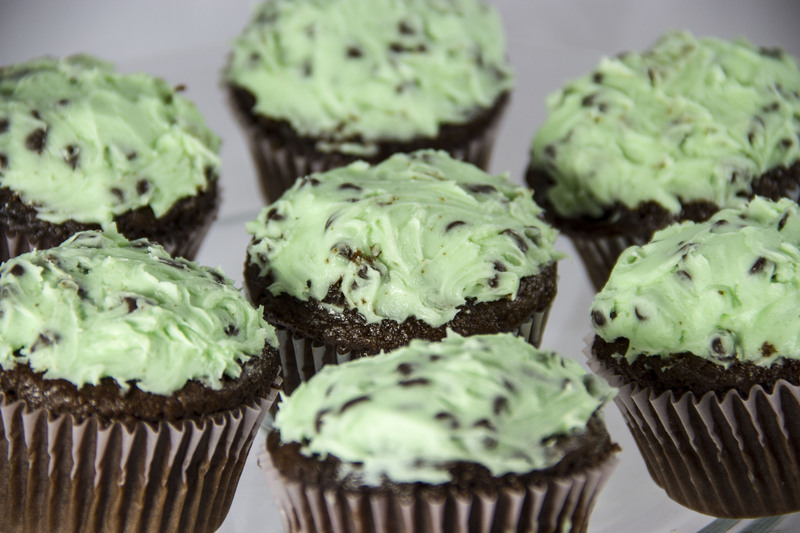 Slather the frosting onto the cooled cupcakes or pipe it on using a pastry bag. Top with sprinkles if desired. Store cupcakes in the refrigerator until ready to serve.